Home Columns A Second Chance for Phoebe! A Second Chance for Phoebe! It was a sunny morning at the Rancho Mirage Community Park. Wilma Sullivan was walking her dog when she arrived at a clearing. Another dog walker had just called animal control, and Wilma peered through the bushes to see a small, badly matted, terrified dog that was infested with ticks. The exhausted, emaciated animal could barely issue a weak little bark when the animal control officer arrived to transport her to the shelter. The dog’s past life is a mystery. We do know that no owner came looking during the holding period at the county shelter, the Coachella Valley Animal Campus. But Wilma could not forget the dog we later named Kiera, “I couldn’t stop thinking about this little creature, and I felt compelled to make sure she got a life, a good life in a new home”. Wilma telephoned the shelter daily to check on her status and obtained her identification number for tracking purposes. She learned the dog was treated for ticks, and her initial fearfulness had subsided so she could be adopted by the general public. Sadly, it is not uncommon for people to abandon animals. They abandon animals of every breed and of every age. They abandon animals who have shown them love and loyalty for many years. They abandon puppies and adorable young animals like 1-year-old Kiera. The evidence suggests Kiera was most likely abandoned, and that her early life was not in the best of homes. She shirks if you move too quickly or raise your arm. Did her former owner purposefully drop her off in a park frequented by people where she might be found? 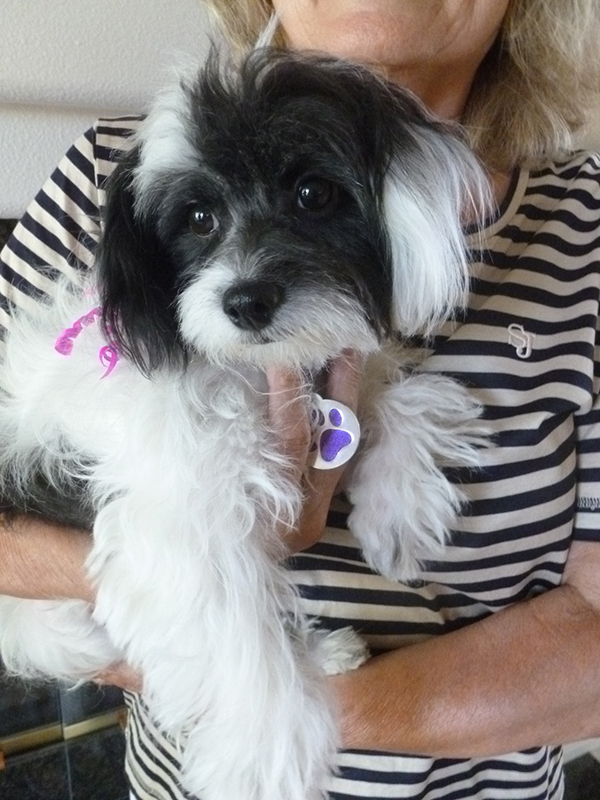 Wilma could not adopt a third dog because one of her two dogs was having medical problems. Determined to help, she contacted Loving All Animals and they arranged for a foster home for Kiera and rescued her from the shelter. This strikingly beautiful dog appears to be a blend of Maltese and Havanese. Kim Kirmss was just preparing to head back to the Coachella Valley when she got the call to foster. Kim was amazed when Kiera arrived, “What a gem this dog is! I was at the right place at the right time. It’s unbelievable to me that anyone would allow her to leave their home and not go looking.” Kim rearranged her vacation schedule in order to continue fostering while Kiera was groomed, spayed, and preparing for the next step….adoption. Kiera was skittish when she arrived at Kim’s home. But the dog was smart, and quickly learned how to use the doggie door. She seemed to know boundaries, waiting for permission to enter each room. Kim immediately thought of her good friends, Cecilia and Irvin Cohen, who were in the market to adopt a small dog. The Cohens were out of town, and Kim sent them an email with the dog’s photo with a note, “You’re going to love this one…I’ve found our next Precious!” (referencing their Maltese who passed away several years ago). One look at the dog’s cute photo sealed the deal for an adoption. Phoebe is one of the lucky ones, and she will never be hungry or terrified again. Her world is now full of love and kindness. She teaches us humans that we too may have a chance for a “second act,” a new lease on life if we just keep the faith. There is a happy ending for Phoebe thanks to a good Samaritan, a loving foster mom, and a couple who treasure their new pet with the love she deserves. Loving All Animals could save more precious dogs and cats if we had more foster homes. Contact us at (760) 834-7000 or www.lovingallanimals.org. Previous articleThe Wine Bar Scene Swirls!